Visit Our Website for Much More!! If web addresses do not show as links, copy and paste them into the "go to" line of your browser. to re-sign up and continue receiving your copy of the Ezine. I'm not much for spring cleaning on a schedule set by marketing gurus, and prefer to clean when the spirit moves me like when I needed to find my husband's high school soccer letter (yes, back in the 1950s his high school had a soccer team). I dragged out four storage boxes in the garage before I found what I was looking for (it was a bit moth-nibbled after 57 years). Then I needed to tackle putting the boxes back...OR...I could purge what was in them and only put back selected "stuff." That last burst of practical insight resulted in replacing only one storage box. The content of three boxes was tossed. This "spring cleaning" didn't focus on cleaning, but on pursuing the past. My mind wandered to memories engendered by the items I found, or to items I thought should be there that weren't. Is there a hidden message in this exercise? It reminded me of going through my parents' garage treasures after they died. My sister and I, six grandchildren and one college-age great-grandchild searched through the "treasures" for anything we personally might want to keep. It wasn't,, "Should we save this because someday my third son will be interested in owning it," which may be justified by the future; but rather, "By saving this will we better understand who my mom was?," which focused on the past. I vividly remember at age six seeing a photo of my mother in a middy blouse, and her telling me she was 12 years old in the photo. "No way! She was never 12-she's my mom!" and in my mind that was her only life, then and forever. My children were in their 30s when they had the same middy blouse photo-moment. It was the weekend of my mother's funeral, and they'd found her diaries from junior high and high school. They couldn't believe she was once so much fun! Had the "stuff" in her storage been shared with them years before, they would have appreciated her at a different level, in a different way; in a way that related to their own growing up. They would have understood what adventures and thoughts contributed to the young girl who had had wild fun as a teen and came back to marry the kid upstairs (their grandpa) who'd loved her since they were both eight years old, when she was good friends with his twin sister. They would have better appreciated the "Grandma with the white hair" (which is how one of her great-grandchildren referred to her) who visited a few times a year to see their ballgames and graduations, weddings and babies' births. Surely who I was when my children were old enough to really remember me was a composite of who I was at three and six and sixteen. What can I leave them that will give them insight into who I was before they knew me? Spring cleaning, regardless of the month, should be done with regard to what you are saving and to whom will it mean something in years to come. If the answer is, "no one will care" about the box of matchbook covers, toss them. Then ask yourself, "Is there a missing step here?" If I save treasures, should I also write down prominent memories of my life related to things in garage boxes? Should I record other memories that have no concrete evidence in saved "stuff" so that someday they will be found by those who cull through remnants of my life gaining greater understanding of who I was? Pull out memories stored in the recesses of our mind, or in boxes and record them, on tape or in written form. Share our memories with those who also lived them and find that the joint exercise brings back related memories we couldn't recall on our own. Maybe this is the more important spring cleaning. The charms I won from the Newark News weekly children's-coloring art contest are long gone. But if I write how disappointed I was with the five-charms prize and therefore never entered another of their "stupid" contests, my children will understand it wasn't judgment of my coloring as the best they received that impressed me, but how chintzy they were with the prize. I felt I knew how good my coloring was. Or thought I did. What does that tell my kids about their mother? How does it relate to our youngest son's winning the Department of Water and Power contest in fourth grade for his essay on water? He won a two-wheel bicycle, but he was so very tall for his grade that the bicycle was too small for him to ride. We sold it to the kid next door, supplemented the money, and bought our son a larger, full-sized two-wheeler. What would HE write about that event to pass on to his children that would give them insight into who "Daddy" really was? Reading about my disappointment with my prize at age six, would he understand why I had to "fix" his prize and bring it up to the level of his expectations? Make our memories available to our descendents to experience in contemplation of our life and anticipation of their own. Written words, taped conversations, CDs and DVD, save memories and take many less boxes than "stuff." So spring-clean this month either because the marketing gurus say that's what you should do now, or because it's time to decide what about you, you will leave for your descendents. A2. HOME ALONE DOESN'T MEAN LONELY by JK, Wyndmoor, PA.
Are you lonely, or are you alone? Are you even aware of the difference? There is an important distinction; you can be both alone and lonely at the same time, or at different times. But alone, not lonely, is the topic here spending time alone at home. What is the difference? Separate, apart, or isolated from others. 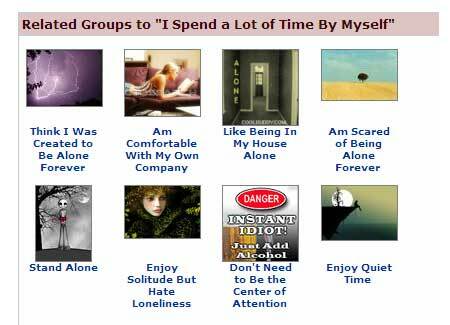 Would you agree that "alone" generally is a more tolerable and pleasant state of being? If so, how do you move from feeling lonely to just being alone. An important first step is to accept being alone, rather than to resist it. What's equally important is to understand that spending time alone at home is a skill that can be learned. And, along with acceptance, mastery of being alone can help to alleviate feelings of loneliness. It also offers freedom you may need to make better life decisions. Many people remain in bad or unsatisfactory relationships because they fear being alone. Conversely, the fear of being alone drives them into relationships that aren�t right for them, only to find that they have arrived right back where they started-- feeling lonely. Sometimes, being alone is a gift, opening up a deep well of time you didn't have before. Perhaps you have retired, lost a spouse or partner through death or divorce, or are by yourself because of a disability or the loss of the independence you once treasured. So, now what do you do? Some people approach being alone just as they did in their pre-alone life. People who were highly structured and once super-busy with work, family and outside interests even to the point of frenzy tend to feel that they must be productive or doing something all the time. These folks are now often prone to feeling guilty, which is not at all productive. People accustomed to more laid-back living find that their lives are piled high with "musts" and "shoulds," fueled by regrets. In other words, now is the time to get busy and do the things they never did. They may feel a compulsion to fill up their days with the old, buried "shoulds": I "should" clean out all the closets, the garage and the basement. Or, I "should" catch up on reading all those books I intended to read, but never did. Or, they may feel that they should give up the guilty pleasures of watching television, or of simply doing "nothing" at all staring out the window or even into space. These "nothings" may actually be worthwhile. Contemplation and reflection, time well spent, can be good for emotional and mental health. In other words, being alone can be a time to learn something new about yourself, a space for introspection about what makes you who you are. A time to ask yourself what do you believe in, and why. Are there any things that don't seem right to you? What do you believe at face value (or accept as a matter of faith)? Do these descriptions hit the nails on your head? One way to begin to learn the skill of being alone is to explore new ways of thinking and behaving. More specifically, the highly structured person could adopt the behaviors associated with the laid-back approach to living. And vice versa. Then there is the issue of boredom. As silly as it seems, some people have made a specialty of boredom. You probably are not familiar with the "Boring Institute," (why would you be?) in South Orange, N.J., which was started as a spoof. Its website says it now plays a more serious role describing "the dangers that are associated with too much boredom and offers advice on how to avoid it." Envoy of Ennui Calls a Meeting; An Energy Bar for Everybody"
Humans need affection; without it they become bitter and hate the world around them. Pets are always a source of affection and will give loads of it endlessly. Pets also provide someone to talk to. No, it's not weird that you talk to your pet; it's weird if you don''t. Just be cautious that, unless it's a parrot, your pet doesn't talk back. If so, seek professional help. If you hold yourself aloof and are the self-sufficient sort, tropical fish, hamsters, budgies or finches are great choices. If you like a little interaction, but not a lot of maintenance, try a cat. If you want to be very hands-on, spend lots of time and get lots of feedback, a dog is for you. Music If you are a music fan then you can enjoy being alone by listening to music you enjoy or music that brings back memories of certain events. At the same time, open yourself up to new genres of music you aren't familiar with jazz, swing, classical, ragtime, etc. Other people It's important not to forget others in your life - keep in touch with other people and continue to expand your social network. For extroverts, enjoying being alone may come as more of a challenge. Reading Now may be the time to catch up on some of your reading. Not only is it enjoyable, but books are a source of education and a way to round yourself as a person. For those who have always been more comfortable with structure, selecting books is a good opportunity to experiment with to being alone. It can be a time to break old habits and explore new ones. For example, if you have always read non-fiction, try fiction. If you have always read novels, try biographies or history. However, instead of structuring your reading by creating a list of books to read and attacking them one by one, go to a library or a bookstore. Throw out that list. Try something different. Spend a half-hour or more just browsing and seeing what looks interesting. On the other hand, for those who tend to wander through their day not knowing what to do next, put some structure into your life by creating just such a list. To make it easier, you could start with a trilogy, which inherently tells you what book to read next. A popular trilogy is Stieg Larsson's The Girl with the Dragon Tattoo, The Girl who Played with Fire, and The Girl Who Kicked the Hornet's Nest. These are compelling novels that many people can�t put down. When you�ve completed that group, rent the movies, too. The Internet Going online opens up a vast new world for people who find that they are now spending lots of time alone. Joining online communities that center on interests or games can be highly rewarding and just plain fun. For example, many people spend time with Facebook's Farmville game, and some people even find cyber-opponents for chess or poker. You can read news and watch movies for free (http://www.hulu.com, and http://www.momomesh.com/, just to name two). There are also support groups for almost anything you can imagine, including every kind of health issue, from heart attacks to headaches. Read true personal stories, chat and get advice, support and help from a group of 2223 people who all say "I Spend a Lot of Time by Myself." The site includes not only the forum, but also has referrals to several guides' sites that offer advice to how-to tips. Anonymously connect with people who share your experiences like those who say "I Spend a Lot of Time by Myself." Read hundreds of true stories, share your own story anonymously, get feedback and comments, chat in the discussion forum, help others, meet new friends, and so much more--all free. Signup takes just seconds. You can join here: join us today! The upshot is becoming an expert in the field of enjoying your own company. As a result, you could be reveling in time alone as much as you revel in time spent with others. Scams never seem to end. This one has been around for many years. Based on the number of news stories it appears that it last fall it made a resurgence. The phone rings, you pick it up, and the caller identifies himself as an officer of the court. He says you failed to report for jury duty and that a warrant is out for your arrest. You say you never received a notice. To clear it up, the caller says, he'll need some information for "verification purposes" your birth date, social security number, maybe even a credit card number. This is when you should hang up the phone. It's a scam, and you could lose a lot, and not just money. We present here some words from those with a birthday this month. Dennis Quaid - "I want to work with great people. Great people really make you better." Hugh Hefner - "Life is too short to be living somebody else's dream." John Madden - "Don't worry about the horse being blind, just load the wagon." Omar Sharif - "Working gets in the way of living." Steven Seagal - "Trust your doubt. Always fight for your beliefs. That is the path beyond thought." The Federal Trade Commission (FTC) has issued tips to help people protect their personal information while they use public wireless networks�Wi-Fi hotspots in coffee shops, libraries, airports, hotels, universities, and other public places. While convenient, public Wi-Fi networks often are not secure. When using a Wi-Fi hotspot, only log in or send personal information to websites that you know are fully encrypted. The entire visit to each site should be encrypted�from login until logout. If you think you�re logged in to an encrypted site but find yourself on an unencrypted page, log out right away. Don't stay permanently signed in to accounts. After using an account, log out. In 1914, he was a soldier and administrator in India. Although doing an important job for the British Raj, Sir Henry was sad because his grandchildren were back in England. Communications were very slow in those days; It took two months for a letter to get to England by boat. Nevertheless, he did not want them to grow up without knowing him, so he decided to send picture postcards to his grandson, Teddy. He had always enjoyed drawing (only as an amateur but this was his way of showing Teddy some of the many beautiful and interesting things he had experienced in his lifetime. 2. Why I Like Retirement-The questions are easy to answer! This issue has been edited by Betsy Day ([email protected]). Copyright 2011 seniorresource.com, ALL RIGHTS RESERVED. Information in this document is subject to change without notice. Other products, service and companies named herein are trademarks or registered trademarks of their respective companies or mark holders and are solely responsible for the content of their articles. Articles are included for informational purposes and are not an endorsement. This Copyright E-zine may be forwarded to others only if sent in its entirety. Other uses are subject to written permission of the publisher.